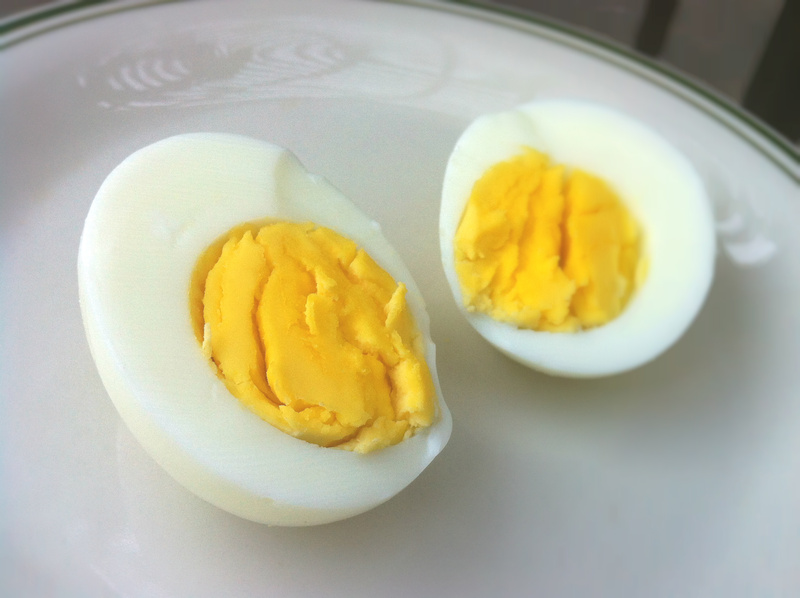 Have you been overcomplicating hard-boiled eggs? Probably. At first I thought Martha Stewart’s recipe was complicated just because she’s Martha Stewart. But then I found other recipes that called for the same kind of method: cover the eggs with one inch of water, leave on stove for exactly this many minutes, drain carefully, la la la. My eyes nearly popped outta my head, seeing all of these somewhat complicated hard-boiled egg recipes. I mean, it’s just an egg. Boiled. In tap water. There are no rules, other than boil the egg. I don’t know. Maybe one day I’ll eat a perfect hard-boiled egg in a fancy French restaurant and my life will change forever. But you know what, hard-boiled eggs can’t get much better than this. 1. Fill saucepan with water to cover halfway up the egg. Or a little more than halfway. Because you’re using less water to boil, you’re saving time and even a little bit of energy. 2. Bring water to boil. Mismatched saucepan lids are fashionable. 3. Turn off heat and leave for 10-15 minutes. Fluffy egg yolk and a soft egg white. This is perfection made easy. Take that, Martha. Take that and eat it for breakfast. Thanks! And haha you’d be surprised the crazy specific ways you’re “supposed” to make hard-boiled eggs! Now those are perfectly hard-cooked eggs–kudos! Yours is the cutest blog I’ve seen. Love all those polka dots/ Appreciate your visit to food for fun’s one crazy summer post. Fun to find you and am drooling over all of your photos. You do good work!! And look at this bright yolks! Plus no grey ring around the yellow. Nicely done! 🙂 Thank you! Although I definitely don’t deserve credit it’s so easy, haha. Ha, those do look perfect! Good job! Oh my gosh! This looks like the recipe I learned in my 8th grade home ec class! I’ve been doing it like this forever and the eggs come out perfectly every time. So uncomplicated! Exactly how I do it. Love me, my eggs! This is how I do mine – mismatched lid and all. thank you for simplifying this! phew! Aw thanks! I’m so glad you enjoy my (sometimes not funny) humor! thank for sharing this post! I find that boiling eggs is a science, and I have yet to master it. I will definitely try this technique. You’re welcome! And I agree soft boiled eggs are quite good!